by Lillian Nakamura Maguire, NAJC Director. 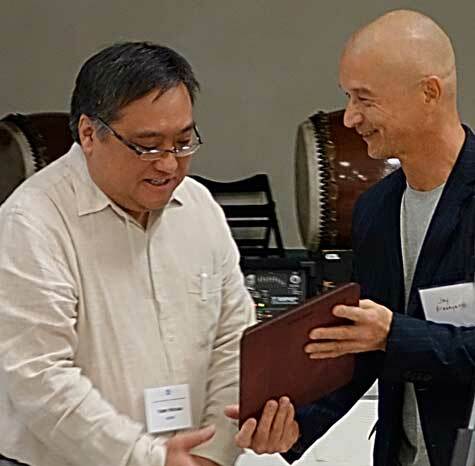 The Dr. Gordon Hirabayashi Human Rights Award was presented to Terry Watada of Toronto, at the recent AGM of the National Association of Japanese Canadians held in Vancouver. Presenting the award was Jay Hirabayashi, son of Gordon. Terry Watada is a respected educator; an outstanding role model for Japanese Canadian youth; a tireless anti-racist activist and an internationally recognized author. The award goes to the individual or group committed to the ideal, as stated in the mission statement of the NAJC, “to strive for equal rights and liberties for all people, particularly racial and ethnic minorities”. It is presented every two years in recognition of an individual or organization in Canada contributing to the development or promotion of human rights and equality in Canada. The first recipient in 2012 was Tatsuo Kage of Vancouver. Since the early 1970s, Terry has been actively involved in raising public awareness of the challenges faced by racialized Asian minorities in North America. As a member of the Powell Street Review, he became involved in writing for several Asian Canadian publications. In 1972 he organized and participated in conferences for Asians. The first Japanese Youth Conference in 1977 was the seed that created the long-running Vancouver Powell Street Festival of which he has been an active participant and supporter. During the years of struggle for redress, he was one of the high profile members for our cause and was often seen on television and heard on radio as a spokesperson for Japanese Canadian redress. As a result he became a target of opponents within and outside of our community. His skill as a writer is well known. He has produced many books on poetry, fiction and history that address the topic of Japanese Canadian experience in Canada. Several of his plays have gained recognition at the international level – most notably his play dealing with mental illness. He continues to contribute to the Nikkei community as president of the Hastings Park Foundation for Rights and Freedoms. A cross Canada promotional tour is being organized to publicize his latest book of poetry titled, Game of 100 Ghosts, published by Tsar Publications. He is also the author of the first Nikkei trilogy in the manga genre. Book One, The Sword, the Medal and the Rosary was unveiled at last year’s NAJC AGM. He is currently working on the re-release of his first album, Runaway Horses, in CD format. Funds from the sale of the CD will be donated to the Nikkei Internment Memorial Centre. During his many long years of creating, performing and community involvement he maintained his career and excelled as a Professor of English at Seneca College for 32 years. The NAJC Board agreed with the Greater Toronto Chapter of NAJC who nominated him, that his contribution to the advancement of human rights and anti-racist education made him the most suitable candidate for the Dr. Gordon Hirabayashi Human Rights Award. DR. GORDON KIYOSHI HIRABAYASHI HUMAN RIGHTS AWARD was established to highlight the importance of the human rights mandate within NAJC and to recognize Dr. Hirabayashi as a source of inspiration for all of us. He was born in 1918 in Auburn, Washington. He was known for his courage and leadership in Canada and the US in upholding human rights principles. In May 1942, Gordon Hirabayashi, a college student, a Quaker and pacifist deliberately violated the curfew imposed upon Japanese Americans and officially challenged the government order on the grounds that it violated his constitutional rights. He lost his appeal to the Supreme Court, serving 90 days in prison. In 1987 the courts reversed his conviction on the grounds that the curfew, internment and uprooting policies were based on political expediency, and not on any risk to national security. After the war, he completed his education, receiving B.A., M.A. and Ph.D degrees in sociology from the University of Washington. Dr. Hirabayshi, became a Canadian citizen, resided in Edmonton and was Chair of the Sociology department at the University of Alberta from 1963-70 and retired in 1983. He was actively involved in the Edmonton Japanese Community Association and founded their newsletter, Moshi Moshi, to keep the community informed during the redress movement. He was a well-known and active member on the NAJC Council during the ‘80s. His historical perspective and strong belief in individual rights helped shape the NAJC redress principles and laid the ground work for future redress settlements such as the Chinese Head Tax, and the First Nation and Inuit residential school settlements. He received the NAJC National Award in 2003. Dr. Hirabayashi died on January 2, 2012.